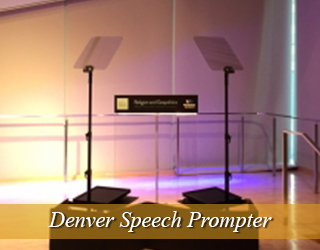 We have the following prompter gear available delivered and operated by an experienced professional. The through-the-lens unit is placed on a tripod and sits on a sliding 15 mm rod. It quite simply allows the talent to read the lines while looking straight at the camera lens. The operator will work closely with the speaker and customize the speed of the scrolling, type size etc.. The Mark III model is perfect for inexperienced talent because a “face to face” connection is established between the director and the individual. Both are able to carry on a conversation while also looking straight into the camera. The Mark II only allows the talent to view the director. The director must look into a camera that feeds his/her image to the unit for talent’s viewing. 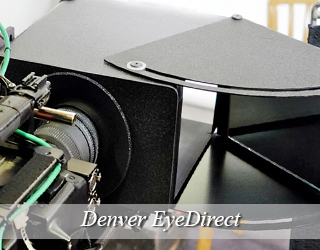 The EyeDirect acts as an alternative to the Interrotron Mark III in that both the director and talent are able to have a face-to-face conversation. The unit is light, portable and easy to use. It also does not require AC power as it utilizes a mirror system to achieve the effect. 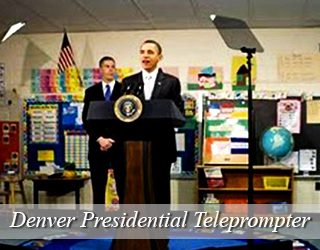 The Presidential Teleprompter is a device often used for speeches given from behind a podium. This teleprompter is a two-way mirrored glass that the audience is able to see through but the speaker is able to see the reflected text clearly on the glass. We are called regularly to the United Nations and have worked with many politicians and celebrities such as Michelle Obama, Bill Clinton, Bradley Cooper, Beyonce to name a few. 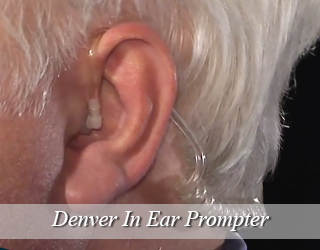 To go along with the teleprompter, we have highly experienced operators who are fully prepared for anything and know how to work under pressure of a live event. Not all speakers like to give a speech behind a podium, some like to walk around the stage or even walk around the audience. 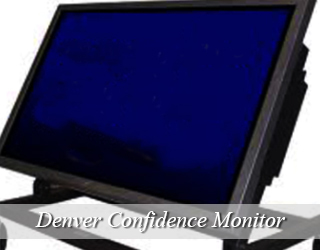 If your speaker is known for walking around, then the confidence monitor is the right system. They are small “flat screen” HD monitors that are placed around the venue and they can pick up any signal from a teleprompter. 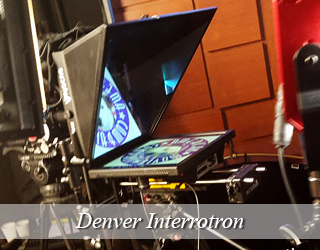 The iPad Teleprompter is great for small productions, tight budgets, and productions with short scripts. Please note that the iPad software can be controlled using an iPhone but it is difficult to control the speed. 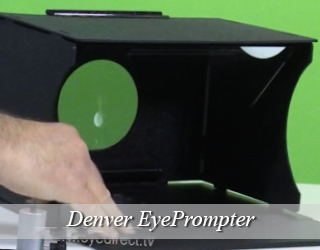 EyePrompter is a one-piece setup that folds flat making it easy it to travel with. 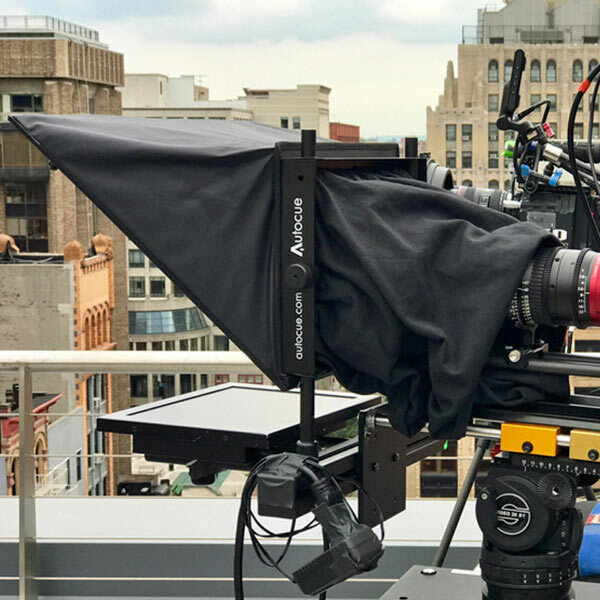 When it unfolds it sits on a small light stand or low C-stand. These stands are not included but we supply adaptors making it compatible with any camera. 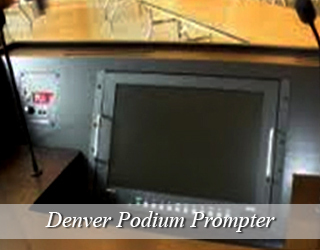 The Podium Prompter is placed on top of the podium, wires are hidden, making it completely invisible to the audience. This type of teleprompter makes it seem like the speaker is a natural because it looks like he/she is just glancing down at notes. 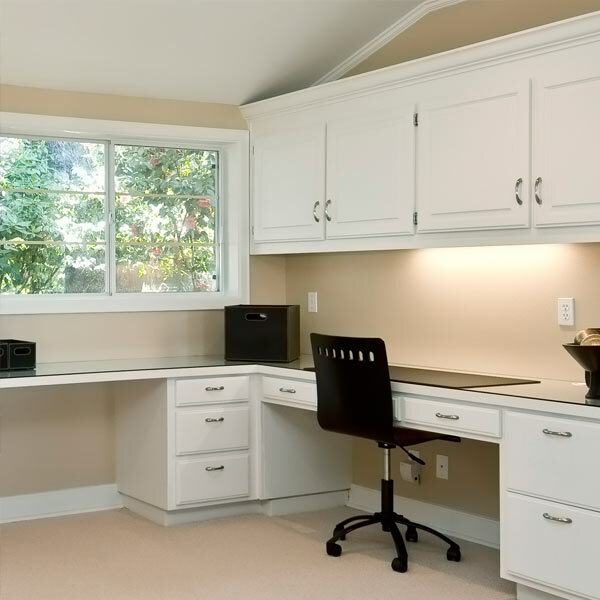 This unit is not available in all locations and is custom-built. Please call Bill at 917-414-5489 for more information re availability and pricing. Please call Bill at 917-414-5489 for more information re pricing and availability. Click on the button below and then call Bill Milling at 917-414-5489 for types, availability, and pricing. Denver, the capital of Colorado, was settled during the gold rush, and in those times, there was a production of Macbeth before it ever had schools or hospitals. That legacy that carries on today, with Denver boasting the 2nd largest performance complex in the country under Lincoln Center. There is a self imposed sales tax that goes to the arts, raising up to $40 million a year, which is distributed to hundreds of arts organizations. It also has a bustling music scene, with multiple world famous venues that have hosted performers such as The Beatles, Jimi Hendrix, and The Grateful Dead. Denver has been the backdrop of many famous films such as Sleeper, Vanishing Point, In the Line of Fire, and more recently, Blades of Glory. The Denver film festival sells over 50,000 tickets a year, and the city is full of beautiful theaters, both box office and arthouse/archive, making Denver a haven for all things film. The staff is getting ready for a busy day! We love our office space! Allow me to introduce some members of our staff. Abigail has been acting since she was 8 years old. Throughout her school and college years, Abigail always participated in plays and was a member of the drama club. She also starred in many of her peers short films. In 2014, Abigail joined the American Movie Company as a speech coach, helping untrained actors (from CEOs to interviewees) feel more comfortable in front of the camera, and to feel more confident when delivering a message. That’s me, Angela, on the left. 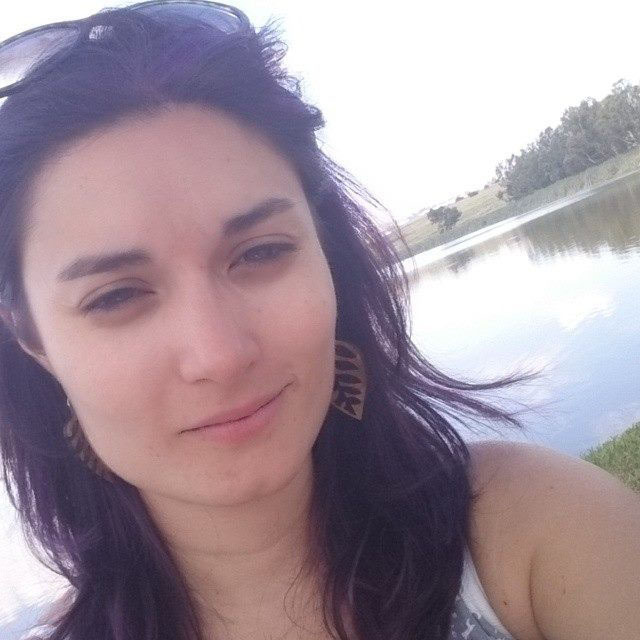 I was feeling so happy that day! My stepfather, Rick, moved my whole family from a small town in Iowa to his place in Denver, Colorado. He taught acting and drama to the youth at The Rocky Mountain Conservatory. I wasn’t quite sure of what to think of Rick when he first came into our lives. He was a tall man with a lean build and a carefully trimmed beard and mustache. He rode a big, noisy Harley Davidson. He stood out. I must admit I was rather surprised at how articulate he was, after seeing him pull up at our house for meatloaf night on his hog. I assumed he would act more like he looked, I guess. Rick was very attentive not only to my mother but to us kids. Flowers and wine for his love and ding dongs and donuts for the thankful kids. His sister, Ella owned a small mom and pop bakery and they made the best chocolate covered long john’s one could possibly imagine. It won’t be long before she’s included in Oprah’s 40 favorite things. My mom travelled a lot in your younger years before having a family. She spent a great deal of time in Europe and was especially drawn to France where she became almost fluent in the language. She studied poetry and writing, French existentialism and abstract art, to name a few of her pursuits. Her marriage to my father wasn’t what she had hoped. They were both too young and grew apart. Of late I have come to realize the value of having things in common with a partner. Honestly, one can only pretend to be interested in what someone is saying for so long before the façade cracks. I observe the real connection between my mom and my stepfather. They speak French rather poorly. He too admires Sartre and other writers that my mom has always been drawn to. His interest in theater and his being professionally trained in London helped spark their relationship. He also loves kids and isn’t one of those guys who pretends. You can tell he genuinely takes an interest in shaping and influencing the younger minds of our generation. He often takes his classes on field trips. Last week they visited the Denver Botanic Gardens. They had fun. The next outing will be to the mansion that belonged to the Titanic survivor, Molly Brown. He feels and I agree with him that being there (being in the moment) is a powerful teaching tool. It’s much better than simply reading about it. It must be clear to you by now that I adore Rick! He’s been a wonderful presence in my life. I am elated to tell you that I have made an impression on Rick. Back in June I got this incredible opportunity to work in the realm of film and television. I now work for a company which essentially provides teleprompters and other gear to the filmmaking community. I am learning a lot. Rick is full of ideas and has ventured out and rented a teleprompter from me! (I am the production coordinator) and practices scenes from plays and his own writings. The prospect of blending theatre and film excites him. I look forward to see him pursue his endeavors and who knows, perhaps even work together! My mom is still very much in love and watches us all with pride. I too am in transition and very optimistic. Jada Nicholson graduated with a degree in Filmmaking from UCLA in 2013. Since then, she has shot a feature length documentary, several shorts and is in the process of producing a comedy web series. 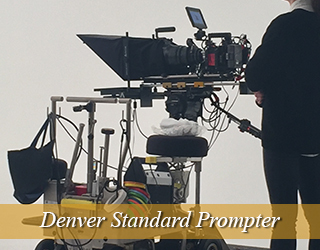 She now handles Teleprompter Rental operations in the Denver area. Jada spends her free time volunteering at a local children’s art program, practicing her yoga poses and relaxing with the office dog, Jodie. 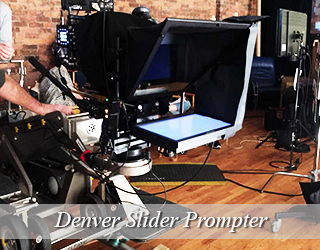 Ryan Friar has been a teleprompter operator with American Movie Company since 2014. He has also directed several shorts and commercials with the company. He enjoys spending his free time watching sports, reading and going to the gym. He is also currently trying to break the record of the biggest rubber band ball in the office. Jodie is a sweetheart, who loves to lounge outside and is effortlessly the coolest one in the office. She can usually be found by Jada’s side. Located in the heart of Downtown Denver, the Colorado Convention Center host over 250 events per year. The first level of the center consists of 584,000 sq. ft. of exhibit space. The second level is the meeting room level, and consists of 100,000 sq. ft. of meeting space and a theatre. The third level is the ballroom level, which contains two separate ballrooms.